Your guests will never guess that there's a whole head of cauliflower hidden in this creamy, tangy, and totally addictive party dip. Every holiday party needs a great dip, and this baked cheesy cauliflower dip is sure to be a hit at yours! We’ve made this dip so many times over the past few weeks perfecting the recipe. I have to tell you that it’s been such a joy because it’s FREEZING outside and there is truly no greater comfort in life than having a hot skillet of creamy, cheesy goodness bubbling and baking away in the oven. Ordinarily, I’d give “party dip” a bit of a sideways glance – I’m not a huge fan of the who-knows-what ingredients plus a brick of cream cheese that are often in them. But I like to think of this dip as a Love & Lemons-does-Midwest-style party dip. 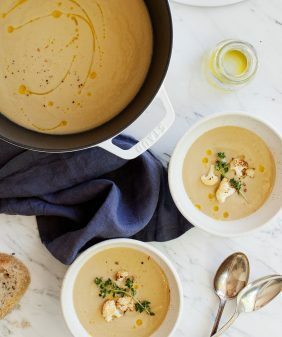 Pureed cauliflower, Greek yogurt, and a touch of Dijon mustard blend together to create its creamy base. 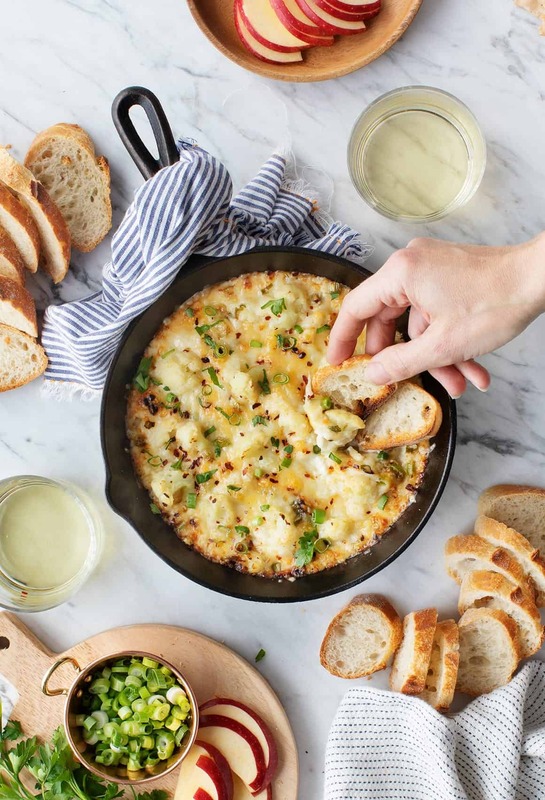 I top it with cauliflower florets, scallions, and a layer of Roth Grand Cru – a nutty alpine-style cheese that’s made nearby (to us) in Wisconsin – that creates the most perfect flavorful, golden, bubbly crust on top. Start by breaking your cauliflower into small florets. Lightly boil it, then blend 3/4 of the cauliflower to create the dip’s base, while reserving the remaining florets to layer in for texture. 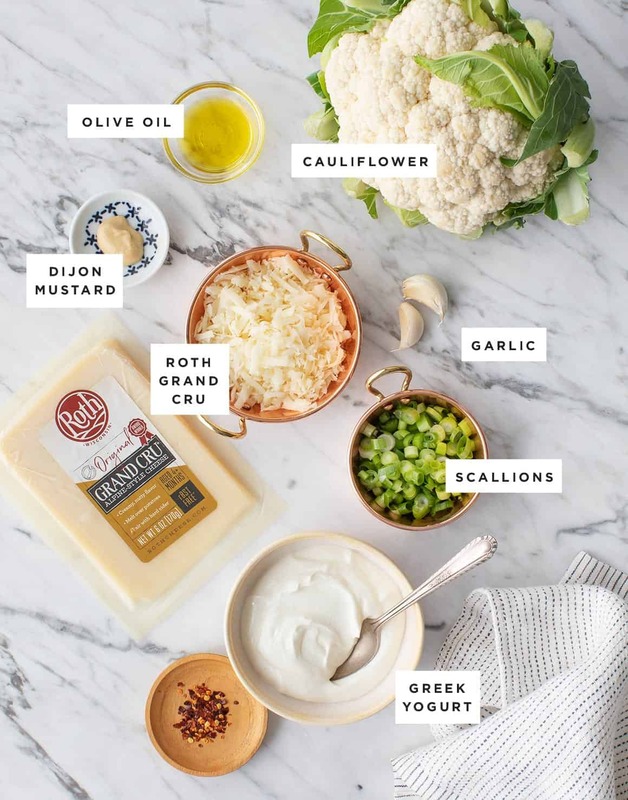 Blend the cauliflower with Greek yogurt, Dijon mustard, and a good pinch of salt. I love how the yogurt adds a bit of tang and the cauliflower becomes lusciously creamy. These flavors work so perfectly with the delicious, mild flavor of the Roth Grand Cru that gets melted on top. We seriously love this cheese – it’s great on cheese boards, and it melts beautifully on this dip. Roth uses rBST-free milk sourced within 60 miles of its creamery to make its cheese, so this is really great quality Wisconsin cheese. Pour the creamy mixture into a skillet and layer it with scallions, cauliflower florets, and grated cheese. That’s it – it’s ready to bake! Bake until the dip is golden and bubbly. Meanwhile, slice & toast your baguette so it’s ready for dipping! 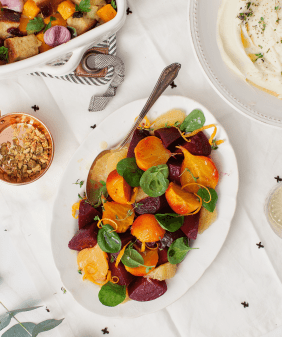 Need to flesh out your party appetizer menu? Head over to the appetizer section of our recipe index for more fun ideas! No one will know that the base of this Baked Cheesy Cauliflower Party Dip is actually a whole head of cauliflower! 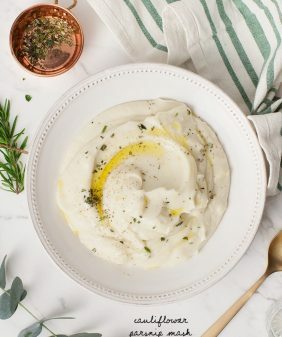 With Greek yogurt and Dijon for tang, this dip is a creamy, flavorful favorite that's delicious with a layer of cheese on top. Bring a large pot of salted water to a boil. Add the cauliflower and garlic and boil until the cauliflower is fork tender, about 8 minutes. Use a slotted spoon to scoop ¾ of the cauliflower and the garlic into a blender (set the remaining florets aside). Let cool completely before adding the remaining ingredients to the blender. Meanwhile, preheat the oven to 450°F and brush an 8-inch cast iron skillet lightly with olive oil. Add the yogurt, olive oil, mustard, and salt to the blender and blend until creamy. Spread the cauliflower mixture into the skillet and top with half the scallions, half the reserved cauliflower florets, the cheese, remaining cauliflower florets, remaining scallions, and pinches of red pepper flakes. Bake 15 to 18 minutes, or until the cheese on top is browned and bubbling. Serve with baguette, crackers, and/or apple slices. Where can I find nutritional information on your recipes? Hi Jean, I’m sorry I don’t calculate nutritional information. What’s a good substitute for Roth? Actually, here in the Phoenix-metro area, no merchants carry this product (other Roth items, yes, but not this). Any Alpine-style cheese (Gruyere, etc.) will be a good substitute. Oh yum! I bet this tastes amazing! Yes! I’d like to know what generic cheese could be substituted as well. Hi, Yesterday I saw your recipe Baked Cheesy Cauliflower Party Dip and yesterday night I was tried and it is fantastic. All family members are loved cauliflower. How can I make this vegan? This looks (and sounds) amazing! 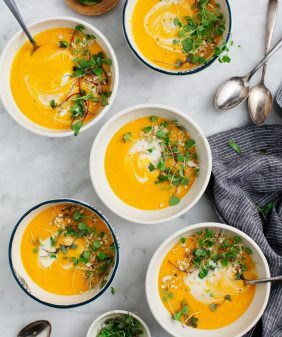 I’m on a cauliflower kick right now so this is right up my alley :). I made this for a holiday party last night and it was a huge hit! I actually bought non-fat plain greek yogurt by mistake (soooo annoyed at myself!) and it still tasted rich and delicious (I did add an extra tablespoon of olive oil to compensate). What I love so much about your recipes is how intelligent they are in terms of using vegetable as the main ingredient. This has so little cheese, yet you would never know.The greek yogurt is so creamy and the cauliflower is so savory that it just works. Was liberal with chili flakes and fresh parsley for added color. Bravo on another good one! I live in Canada, where this cheese unavailable. I know you have only tested with this one but coynd a Parmesan or pecorino work? Unsure of this cheese’s flavour. Any ideas would be aporeciated, thank you. Hi Sue, I would do a mild white cheddar – it’ll create more of a melty topping than Parmesan or pecorino. Hope that helps! Any Alpine-style cheese (Gruyere, etc.) will be a good substitute. I made this tonight as part of our Christmas Eve dinner (we do a fondue with other hot dippers). My husband was skeptical as I was preparing it but was REALLY impressed with it! I really enjoyed how light it was with the cauliflower base (not so heavy like many dips). I really loved as did my 10 year old daughter! We will make this again! Thank you! ps We didn’t have the cheese you suggested but I used a raw extra old cheddar and it was superb!! My daughter in law made this for us Christmas Day. It was the surprise hit of the dinner. Ooh, I’m so glad to hear that! Hi Ella, I’m sorry I don’t have a vegan version for this recipe or a quick 1/1 sub (I’ll put it on my list to come up with one in the future!). 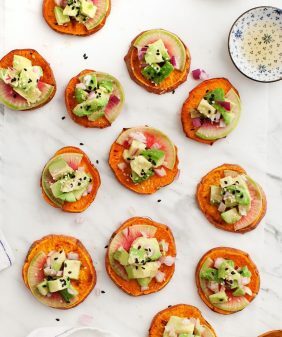 Here are a bunch of vegan appetizer ideas: https://www.loveandlemons.com/recipes/vegan-recipes/appetizer-recipes/. Thank you Jeanine! I will have to take a look at these options. Made this to bring to a holiday party and it was a HUGE hit! Was worth running around to multiple stores trying to find this cheese – haha. Pro tip: It’s carried by Shaws/Star Market but NOT Stop and Shop. 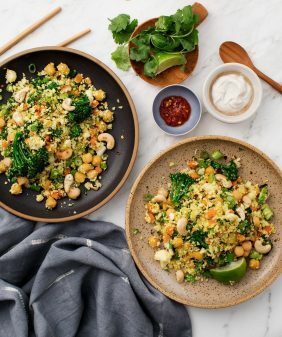 I just love how much cauliflower went into this recipe! So healthy yet so delicious!! I made this dish twice, and it was a hit both times. I love dips, but not how I feel after eating them. This recipe tastes good, and you still feel good after eating it. It really is a nice alternative to a traditional party dip. My guests were surprised the base was cauliflower. I added extra red paper flakes to add more spice. So glad to hear that you loved this one too!